The Texas Baptist Memorial Sanitarium, Dallas. Baylor University Medical Center, Dallas, Tex. In 1909, the operating-room fee was $15 for major operations and $10 for minor surgical procedures at the Texas Baptist Memorial Sanitarium in Dallas. For more than 100 years, the Baylor Health Care System in Dallas, Tex, has been committed to serving the community through quality, safe patient care. Throughout this century of healing, the contributions of surgery and surgeons have been invaluable to the Baylor Health Care System. As we enter the next century, we will continue to see remarkable advances in the area of surgery, advances that will ultimately lead to new approaches in the practice, delivery, and instruction of care. This will prove to be a great benefit to hospitals and physicians who continue to strive for excellence in quality, safety, innovation, and patient satisfaction. What started as 1 surgeon’s vision for a state-of-the-art medical facility in 1903 has now transformed into the Baylor Health Care System, a network of hospitals, primary care physician centers and practices, rehabilitation clinics, senior health centers, affiliated ambulatory surgery centers, and a research institute. Today, the Baylor Health Care System exists to serve all people through exemplary health care, education, research, and community service. Times have changed dramatically since the early 1900s, as the Baylor Health Care System has developed into a health provider with more than 93 000 admissions, 245 000 emergency department visits, 495 000 outpatient visits (excluding emergency department and home care), 15 000 employees, and 2587 licensed beds. As we continue to grow to meet the needs of a changing population, we will undoubtedly see a change in the culture of surgery and surgeons. The future of surgery in hospitals will rest with the best quality care, demonstrating excellent outcomes at the lowest possible cost. Today, quality is monitored through quality assurance committees in charge of evaluating individual physicians or individual disease categories. In the future, this may be tracked by processes such as the National Surgical Quality Improvement Program (NSQIP). Baylor University Medical Center is currently in the process of implementing NSQIP, a program dedicated to the measurement and enhancement of surgical care. The NSQIP program will evaluate 40 to 50 preoperative risk criteria and 20 to 25 postoperative complications in an effort to standardize severity of illness when evaluating patient outcomes. This program will be initiated not only in university hospitals but also in community-based hospitals in conjunction with the American College of Surgeons (Chicago, Ill). Industry leaders will then look at the outcomes made available through programs like NSQIP and compare results across the industry. Competition among hospitals will then be based on outcomes and quality of care as the industry becomes more data driven. Decreasing reimbursement, steep revenue reductions, and rapidly rising costs will also result in increased input from surgeons and anesthesiologists in inventory-control management. As physicians provide more input into operating room revenues and costs, financial performance of individual surgeons and surgical groups will be increasingly important. Standardization of products will be a huge benefit to hospitals as they strive for effective management of supplies in the operating room. In addition, just-in-time ordering will ensure the necessary supplies and equipment are readily available without having to retain them in inventory for long periods. By ordering the right supplies in the right amount, hospitals will avoid large inventory adjustments resulting from unused or expired supplies. As a result, surgery departments will become even more proficient in the areas of operating room scheduling, staff use, documentation, and charge capture. As a result of difficulties experienced by major employers who are attempting to keep up with rising health care costs, the health care industry today will see a remarkable change in the delivery system of care in the United States. Organizations like the Leapfrog Group (Washington, DC), a coalition of 160 Fortune 500 companies, will demand breakthrough improvements in safety, quality, and affordability of health care for Americans. As an organization responsible for the health care needs of 34 million Americans at a price tag of more than $62 million annually, the Leapfrog Group possesses significant leverage for driving the transformation of our delivery system. The industry will then see a greater shift toward consumer-driven models as employees share a greater responsibility in the management of their care. Consumers will also be well-informed patients. The Centers for Medicare and Medicaid Services (Baltimore, Md) and the Joint Commission on the Accreditation of Health Organizations (Oakbrook Terrace, Ill) are already driving initiatives that place a greater emphasis on the monitoring and reporting of quality measures. Other organizations like Health Grades (Lakewood, Colo) provide consumers, payers, and employers with detailed information that allows them to compare comprehensive reports on the quality of physicians and hospitals. As a result, surgeons will have to respond to patients who are more knowledgeable of their surgical options through increased monitoring of the latest available literature in surgery. Health care systems will continue the expansion of surgical services. One of the most visible examples is the construction of emergency hospitals, which will include treatment of the severely injured patient as well as nontrauma emergencies. These hospitals will be staffed by trauma or emergency medicine surgeons who will benefit from the ability to maintain their general surgery competency by operating on emergency general surgery cases in addition to trauma cases. This will have the added benefit of preventing trauma surgeons from experiencing a decrease in their general surgery skills. As new hospitals are built, the operating rooms of the future will include multidisciplinary physician representation to accommodate procedures being performed jointly by surgeons and interventionalists. These models will be used for both routine and invasive surgical procedures. In the future, the health care industry will demand increased participation from departments of surgery in the area of revenues and costs. This will take place in the operating room and at the bedside. Because of the rising demand for clinical innovation, new technological devices, implants, and equipment will lead to dramatic increases in costs for most of the hospital’s key surgery lines. This trend of cost increases for key service lines will entail margin decline for cardiac catheterization, orthopedics, neurosurgery, vascular surgery, and a number of other procedural lines, resulting in the decreased ability of hospitals to cross-subsidize less profitable service lines.4 As a result, the expectations of the chair of surgery will be much higher than before. The future chair of surgery will be heavily involved in administrative responsibilities and coordination of specialty divisions and departments. Where there is more than 1 hospital in an organization, like the Baylor Health Care System, the chief of surgery will have greater responsibility for standardization of patient care across the system. As physician reimbursement continues to decrease, services that were previously performed by physicians on a voluntary basis may now require compensation for time spent on major committee assignments. In community-based hospitals, unlike university hospitals, many surgery department chairs are elected by service staff on a voluntary basis. These positions rotate every 2 to 3 years, decreasing continuity in administrative procedures, which may have the adverse effect of hindering long-term improvement in surgical service operations. As a result, there is a need for hospitals and health care systems to have greater continuity in the administrative responsibilities of departments of surgery. For academic medical centers, changes to the limits on work schedules for medical residents will result in an additional impact on the hospital workforce. Regulations made by the Accreditation Council for Graduate Medical Education (Chicago) in 2002 currently restrict resident work schedules to 80 hours per week, with the possibility of further reductions in the future. Work schedules of attending staff in addition to those of medical residents will be considered in this regard. As a result, hospitals will be forced to further redirect many of the routine services now provided by residents to other employees, a change that will ultimately involve additional costs. As the demand for various staff increases, hospitals will have to devote greater attention to system functions. These changes will result in the increased use of paramedical personnel, such as physician assistants and nurse practitioners, many of whom have become extremely proficient in assisting surgeons in centers of excellence. A total of 75 million baby boomers, or 26% of the US population, will begin to reach retirement age in 2013,5 a year that will signal the start of huge changes in health care spending levels in our country. The changing demographics of the US population will certainly place an unprecedented stress on our nation’s capacity to deliver health care. By the same measure, the changing demographics will also have an impact on the training received by surgeons, who will need to become further educated and possess an increased awareness of the needs of the aging population. In the past, age has been a factor that would prevent certain major surgical procedures, but that will soon change as the culture of surgeons with respect to the aging population becomes further developed. Enhancement of such services will occur in the future as support services for the geriatric population become more readily available. The Baylor Jack and Jane Hamilton Heart and Vascular Hospital (Dallas), a joint venture model between physicians and Baylor University Medical Center, opened in June 2002 as the only hospital in north Texas dedicated solely to the care and treatment of heart and vascular patients. The Baylor Jack and Jane Hamilton Heart and Vascular Hospital continues to excel in the areas of quality and patient satisfaction. As hospitals enter into joint ventures with physicians, surgeons will benefit from a comfortable work environment as well as operating room personnel who are trained in very specific specialty areas. Service lines will continue to experience greater movement toward outpatient settings; therefore, hospitals and health care systems must develop strategies to achieve a sustainable competitive advantage in the marketplace. According to the Health Care Advisory Board (Washington, DC), outpatient services generated nearly 50% of patient care revenue for a typical hospital in 2000.6 As a result, expansion of services into growing markets is essential for success. To achieve a stronger presence and expand into new markets in the Dallas/Fort Worth Metroplex, the Baylor Health Care System has partnered with United Surgical Partners International, Inc (Addison, Tex), a surgical services company specializing in the development and management of ambulatory surgery centers and surgical hospitals. Currently, United Surgical Partners International, Inc and the Baylor Health Care System have created joint ventures with physicians in 15 ambulatory surgery centers and 5 surgical hospitals. As these models continue to grow, surgeons will be able to benefit from shared ownership and the ability to work in a comfortable environment that is focused on quality, cost-effective care. Health care professionals will also place a greater emphasis on programs that enhance patient safety. House officers and attending staff in surgical residency training programs will need constant education regarding new drugs. 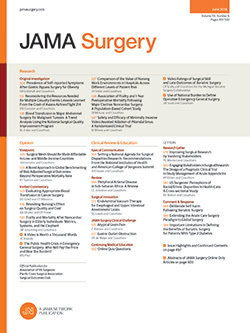 In a recent study conducted by pharmacists at the Monmouth Medical Center (Long Branch, NJ) regarding medication errors in a surgical residency training program, more than 50% of medical errors were attributable to specific knowledge deficits.7 In the future, medication errors will be reduced through improved processes using information technology. Baylor University Medical Center will look to implement a positive patient identification initiative to accomplish this objective. This will allow clinical staff to closely monitor patient safety by providing effective patient identification solutions, ultimately resulting in decreased medication errors. Programs such as the positive patient identification system will ensure that health care professionals have the right patient, right medication, right dose, right time, right route, and are fully aware of any existing patient allergies. In addition, the positive patient identification system will allow clinical managers to evaluate performance by tracking several key metrics, providing valuable information that will lead to continuous process improvements. Clinical Transformation is becoming a reality through the leadership and vision of team members from across the system. The Clinical Transformation advisory board is composed of current board members as well as physician and administrative leaders who will create a health care environment that supports the ideal patient experience. Clinical Transformation will also provide the Baylor Health Care System with an enterprise technology platform that supports increased access for patients, shared information for health care professionals, and effective health information management for everyone. The goal of Clinical Transformation is to place the Baylor Health Care System in a position to exceed all standards for quality and patient safety. Throughout this process, surgeons will provide valuable input regarding the future of surgery. Baylor Health Care System will, before the end of this decade, become the most trusted source of comprehensive health services. Correspondence: Joel T. Allison, MS, Baylor Health Care System, 3500 Gaston Ave, Dallas, TX 75246 (joela@baylorhealth.edu). Accepted for Publication: December 1, 2004.